Being a sports reporter is, at times, an absolutely horrible job. Sure you get to watch games, travel and interact with athletes, but there is a horrendous downside. (Which is pretty much everything else.) And this is never more disturbingly clear than when a reporter has their first (or 50th) awful experience with a half-naked, exhausted athlete. Sometimes they'll be openly dismissive, sometimes they'll yell, and sometimes, well, they'll fart in your face. Most of these stories never end up in the newspaper the next day. So now, Deadspin proudly presents "The Dark Side of the Locker Room" where current and former sports writers can share some of their most distressing interactions. If you've got your own story to share, please send it along to ajd@deadspin.com. Tommy Craggs is a writer for Play and Slate and other magazines. Tommy Craggs spent an enlightening period of time with the Knicks' Stephon Marbury for a New York magazine profile. Here's one part that didn't make the story. 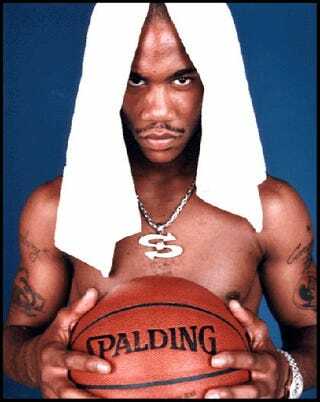 We were sitting in a Charleston, S.C., hotel room, Stephon Marbury and I, debating the finer points of Holy Scripture. Specifically, we were talking about Noah's Ark and spaceships, but let's not get ahead of ourselves. This was a little less than a year ago, the night before training camp and in retrospect probably the last good night any Knick would have that season. I was in Charleston on assignment for New York Magazine, working on a profile of Marbury, who in the preceding six months had given an excellent impression of a man gone completely and very publicly round the bend. There were the rambling interviews. There was the cameo in the Anucha Browne Sanders lawsuit, from which we learned that Marbury was doing full-gainers into the Knicks' intern pool. And there were the weird pronouncements: "I drink life's happy water which is bottled at the divine source," he blogged for the New York Post at one point, a sentiment that falls roughly halfway between Lourdes and Jonestown. It was getting late, and Marbury was tucked snugly into bed, and all I could see of him was his large bald dome, lolling about just above the covers. A personal assistant, a fellow named Gaylord, was snoring softly from a nearby couch. We were on the sixth floor of the Charleston Place hotel, where earlier in the day Marbury had checked in under the initials "JCIMS." In the past, he told me, he would travel under a series of different names — usually "Star-something," he recalled. But perhaps he found it a touch grandiose, naming himself for the firmament. So "JCIMS" it was. Jesus Christ Is My Savior. We talked about many things that night. About the Knicks. About his shoe line and his philanthropy. About the business of basketball. (It was here that he declared memorably: "If I didn't play the way how I played, I wouldn't have gotten no max contract. ... Don't get mad at me, because I'm telling you what's real. One plus one is two, all day long, and it's never gonna change. And that's factorial.") He spoke wistfully of the family time he'd sacrificed for the game. "Like my son going to the bathroom for the first," he told me. "Those are monumental moments." Mostly, though, Marbury seemed bored. He had played basketball's boogeyman for so long — since the start of high school, really (reading The Last Shot now, you're struck not by young Marbury's ambition and cynicism, with which we're very familiar, but by the lucidity of his thoughts, with which we most definitely are not). By now Marbury was well-accustomed to explaining himself to journalists, and before long his answers started to drift from their moorings and more and more seemed to be directed at the Monday Night Football game unfolding on his television. It was about this time that I said I don't believe in God. It began when I spotted a Bible on the end table and asked if he had read any of it today. "I'm in Genesis," he explained. "I'm reading from the front to the back." "The good stuff's up front," I offered. Marbury agreed. "Genesis is hot." He turned to me. I knew where this was going. "What's your religion?" he asked. I told him I had none. "At the end of the day, it's all about you and your relationship with — you believe in God, right?" Marbury chewed on this for a moment. "Everybody's different," he said. "You don't believe in God. So ... are you an atheist?" Some bad Abbott and Costello dialogue ensued. Marbury began poking at the edges of my non-belief, trying to take its measure. "So that's like you not believing — like, if I said to you, somebody could jump from the free-throw line, you automatically don't believe it?" "So you don't believe there was a Jesus Christ?" I believe that Jesus was a great carpenter. Marbury laughed. "That's cool. That's what you believe." "... Why does green mean that's the color green? Why can't you say another word for green being green? Know what I'm saying?" "If your mind can transform thoughts to create rockets to go into space, who is to say if an Ark was built? Like, if you could build spaceships to go from off this ground, to go up into the sky, and go land on the moon — you're saying, these things can't happen? So everything gets challenged, you understand what I'm saying?" I did not, but he was rolling now. "So at that time, they probably would say, 'Nobody can make a rocket to go up into space.' You know what I'm saying? Who's gonna build it, how they gonna built it to go all the way up?" It soon emerged that Marbury had never met an atheist. And so, for a half-hour, he turned the questions onto me. He asked if I felt lost. He asked if I felt confused. He asked what I wanted out of life. He invited me to church. (Marbury goes to Christian Cultural Center, a megachurch at the far edge of Brooklyn. It's the sort of church that has ATMs. A few weeks after this interview, I texted Marbury and asked if his offer was still good, joking stupidly that God might strike me down at the door. He responded: "GOD will never strike you down. GOD is love and love is love. You don't get it, and that's ok. In time.") Atheism seemed to confound him. I ventured that in fact he probably had met an atheist before, and that many, if not all, of the journalists covering him are very likely atheists (not that I had any evidence). "For real?" Marbury replied. He thought that over for what seemed like a long time. The next day, after practice, I was milling around the sideline with the rest of the media. I heard someone call out. It was Marbury, splayed lengthwise and propped on an elbow. He was rolling back and forth on some sort of padded cylinder. I went over to him. The beat guys, none of whom knew me from Adam, turned to look at me. "All?" Marbury asked, gesturing to the press. "All of them?" Embarrassed, I explained the matter to my colleagues. Howard Beck, from the New York Times, just shook his head and smiled thinly and began to walk away. "I'm not even going to touch that."